Years after my young daughter’s death from a rare genetic disease, when I was developing Courageous Parents Network and turning my gaze outward to consider the wide spectrum of issues related to serious illness in children, I began to wonder about the psychological, emotional and spiritual orientation of the medical providers who work with such sick children and their families – the people who have chosen as part of their profession, their vocation, to spend time with children who are in pain, perhaps dying, and the family members who are part of the package. For many of the providers, the desire to treat and cure is a driver; but all of them inevitably also encounter the cases where the disease prevails over the medicine. This is most especially true of pediatric palliative care doctors, nurses, social workers, chaplains who work with the most seriously ill. How do these sentient human beings cope with the sadness that they witness? How, if at all, do they reason with the reality that children die? How do they keep going? And what do pediatric providers and parents have in common, besides the desire to help the child? 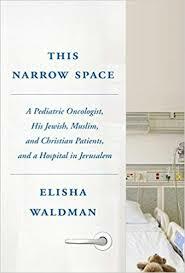 I was thus utterly compelled by This Narrow Space, the 2018 memoir by the American pediatric oncologist (and now pediatric palliative care doctor) Elisha Waldman. Raised in an observant and conservative Jewish family in the United States, in 2007 Dr. Waldman does aliya and moves to Israel as a pediatric oncologist at Jerusalem’s Hadassah Medical Center. The memoir is in equal parts a meditation on medicine, religion, spirituality, identity, and politics. It is a love story about the families of Israel and Palestine – Muslims and Jews — the human spirit, the courage of children, and the devotion of parents. It is also a window into one particular doctor’s journey to understand how to BE and how to BELIEVE in a world where bad things happen to good people: where children get sick and die. There is much to recommend about this book, including its perspective on life in Israel in the 21st Century—with its opaque bureaucracy, ongoing cultural clashes and ever-present threat of violence and war—and its exploration of why an oncologist chose to become certified in palliative care. But what I appreciate most about it is how Elisha explores the near-existential concepts of Courage and Meaning in the face and context of serious illness in children. These are things I think about also, and, as noted above, I have wondered for a while now how pediatric providers wrestle with them. Elisha Waldman is both a critical thinker and a generous sharer of his inner reflections, and I found myself nodding at the questions he poses and embracing as true-for-me-also the sort-of-answers he gradually arrives at. There is nothing pat or simple here; quite the opposite – it is nuanced, sincere and utterly compelling. As I moved through the book, I dog-eared the pages that explicitly explore these concepts and illuminate his spiritual inquiry. Here are some of the highlights. Early in his post-fellowship career, in a private pediatric oncology practice, Elisha can feel himself struggling. Facing a personal and professional crisis, he turns to his father, a Conservative Rabbi, for help but his father answers honestly and brutally that he has no idea. Elisha chooses to move forward carrying the burden of his questions, but he is now cracked open and, with increasing frequency, acknowledges moments where neither his religious education nor his medical training has prepared him for specific patient encounters. He tells us of Sam, a 10-year old boy with a recurrent, metastatic tumor whose life has become an unrelenting series of chemo appointments, interspersed with admissions to the hospital for fevers. Alone in the hospital room with Dr. Waldman, Sam suddenly opens up about his anger – “I’m tired of the hospital. It’s not just this admission … I know my counts will go back up… It never ends. I’m not getting better… I’m tired of the treatments…I’m going to die anyway!” Dr. Waldman is at a loss of how to respond to the heartbreaking brutal matter-of-factness of this child. He feels unprepared by his training for what to say. He is saved by the boy’s mother’s return to the room, when the subject is changed. 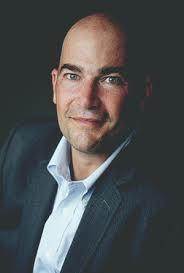 Dr. Waldman never addresses Sam’s feelings with Sam directly or shares them with Sam’s mother. Sam dies at home. The memoir takes a side trip to the Himalayas where, two years into his job at Hadassah, Elisha has gone on vacation to trek and summit a peak above 19,600 feet. He has come to love the pain+pleasure that accompany physical exertion at low-levels of oxygen in the mountains. On this particular ascent-summit-and descent, however, the exertion is particularly life-threatening and the conditions especially harrowing, occurring largely in the dark of night, and it is almost by accident that Elisha survives. For me, this was the most illuminating moment in the book. In describing what he has found is true for him, Elisha puts into words what I have intuitively felt to be true for myself. And that this revelation is set in the mountains following a harrowing trek strikes me as metaphorically perfect: in the face of life-threatening illness or grief or both, the only thing we can really do is to keep moving forward, one step at a time. Elisha navigates a narrow path on an icy mountain side in the dark. Families advocate for their child and make impossible decisions in the absence of a crystal ball with life and death in the balance. Hope in the face of uncertainty. Hope alongside uncertainty. Hope and Uncertainty as our constant companions. There it is. I can live with this.